My friend Richard Caire and I roomed together in college. The third member of our little confederacy was Sam Hopkins, and all three of us majored in art. Richard has focused his talents on photography and Photoshop manipulation to create some truly beautiful works of art. 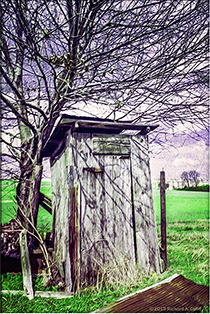 He sent me the attached image of an outhouse near where he lives, and it reminded me of a story. Anyhow, we were taking art with no real notion how we might make a living at that. Actually, we were taking art so we could drink beer, thus my claim I minored in beer. We three happy-go-lucky, beer-swilling smartasses show up for the first day of a drawing class in the fall of 1963, and after all the introduction stuff, we get our first assignment, which was to venture forth and find a nice house and draw it. The instructor’s assumption was that we would wander off campus and sketch one of the many beautiful old homes around the college. Oh no! The Three Amigos had to turn a simple assignment into a contest of wills. We drove all over the backwoods around Hammond, Louisiana to find an outhouse to draw. They are, after all, “houses,” are they not? It might not surprise the reader to learn that finding an outhouse around Hammond in 1963 was not a major challenge. We found a nice one, kind of leaning like the one in the picture, and approached the owners, an elderly black man and his equally elderly wife, to ask permission to sketch their outhouse. She stood off to the side and looked suspiciously at the three white boys standing there, stupid grins on our faces, sketchbooks in hand, and asking to draw their outhouse. The old man looked at us and rubbed his chin, and I am sure he was thinking, These white boys be crazy! An hour or so later, outhouse properly sketched, we departed and turned in our assignment, expecting … I’m not sure just exactly what we were expecting, now that I think about it. The instructor could have taken it badly and given us all an “F” for being so arrogant, and we would have deserved it. Instead, he evaluated them right along with all the other students sketches of “real” houses. Maybe he thought we were really creative? So we went out for a beer to celebrate.